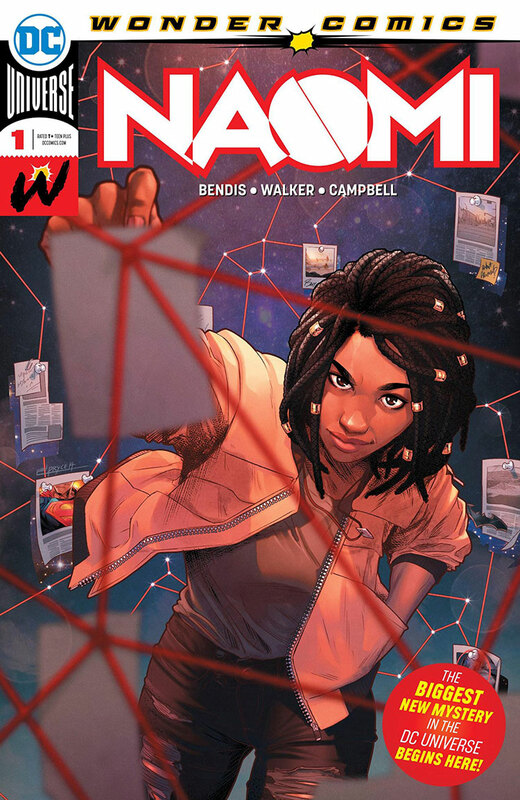 DC Comics’ Wonder Comics imprint continues to impress with Naomi #1, a comic which doesn’t explicitly break any major boundaries, but proves to be a beautiful looking addition to the modern comic landscape which desperately needs diverse, female lead roles. One of the biggest obstacles writers face when they enter an extensive universe of characters is answering the question “how do you make a character stand out and not seem like either an author-insert or a character who was designed to supplant an existing character.” Bendis and Walker are seemingly taking the hardest road by making the titular heroine of the comic, Naomi, technically unattached to any major DC character. This isn’t Riri Williams who was put into the Iron Man-mythos, or Duke Thomas from Batman. Naomi’s attachment to the DC Universe seems explicitly detached, so far at least, from any “brand name” characters … although that doesn’t mean that Bendis and Walker don’t do their best to make sure everyone knows Naomi, who lives in Oregon, is still part of the DC Universe. Perhaps it was because DC wants to make use of Bendis and his current ties to Superman, but the choice to loosely tie Naomi and her story to Superman is the right one. Strangely, parts of this comic actually feel more like a kind of Superman anthology entry which was re-purposed than it does a story about an adopted young girl who wants to feel special; however, it is a credit to both writers that neither the Superman or the Naomi material hinders the other, and both in turn help lay a good, in somewhat bland, foundation. This isn’t a comic which seems ready to re-make the wheel: Naomi lives in an normal town which is deeply impacted by a small scuffle between Superman and Mongul that last only a few seconds. Most of the comic is devoted to establishing the feel of the students who attend Naomi’s school and how they feel about living in a world where Superman can crash into your town. And, really, this is probably the best part of the comic, the slice-of-life feel that is. Like Young Justice #1, Naomi #1 is clearly striving to be a fantastic all-ages book with a youthful appeal. While I hope I don’t seem to harsh on the fact that Naomi #1 isn’t perhaps the most unique of first-issue runs, it is absolutely worth your time and money because of the art and because of how well it complements the vibe of the story. Campbell’s designs for every character drip with uniqueness and vibrancy of expression. Naomi herself receives the most attention, and it shows. Her expressions and the detail Campbell devotes to her makes her the heart of the story. What is also interesting is the use of half-tone, something this reviewer is normally more used to seeing in manga. While some art is re-used in a few places, mostly character models re-imposed here or there, Campbell’s work seems to be at the top of his game.